*Editors note. [update] On January 29th, 2018 Washington State Governor Jay Inslee rejected the permit. Olympia, WA – On November 28th, the Washington State Energy Facility Site Evaluation Council dealt a major blow to a proposed massive oil-by-rail terminal along the Columbia river along the Washington and Oregon borders. The council stated that, “developers had not met their burden to show that the proposed port of Vancouver site was acceptable.” High among concerns were derailments and explosions. In 2016, an oil train derailed along the Columbia river Gorge that promoted the evacuation in the town of Mosier Oregon. The terminal has been widely opposed by cities, environmentalists and Columbia River Treaty tribes. The council, who started its review process in 2013, was inundated with over 250,000 public comments with the bulk opposing the construction of the terminal. This decision comes among a series of successful campaigns led by Tribe’s and environmentalists to stop proposed fossil fuel projects in the Northwest. In January 2017, the Quinualt Nation led a successful campaign to stop proposed oil-by-rail terminals from being built in Grays Harbor. 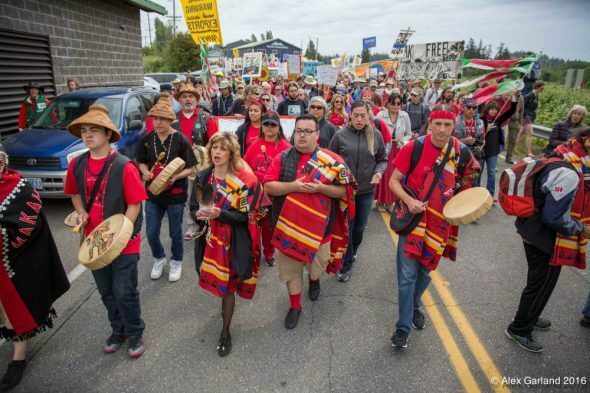 In the spring of 2016, the Lummi Nation helped lead a campaign to stop the construction of what would have been the largest coal export terminal in the nation. 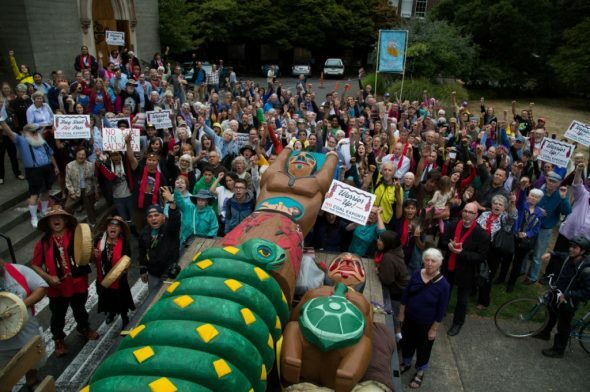 Healing pole carved by Jewell James (Lummi) traveled from South Dakota to Alberta Tar Sands to bring communities together in fight against coal and oil exports. Each campaign has seen a successful partnership between Tribe’s, regional Native activists, environmentalists, and local jurisdictions working together to halt massive fossil fuel projects. 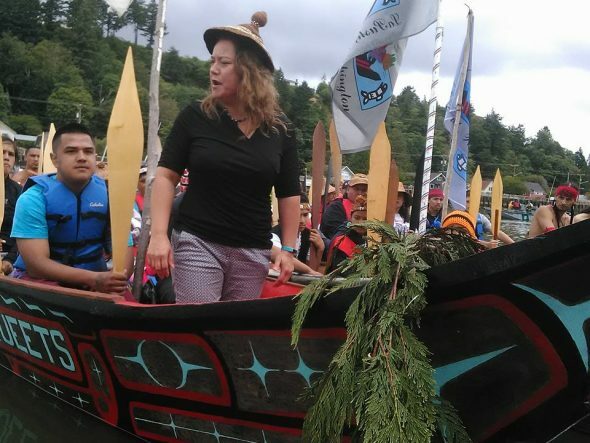 “The efforts coming out of the Northwest demonstrate that you can successfully merge the concerns of Tribe’s with environmentalists and local jurisdictions to craft successful campaigns to halt these treaty breaking, environmentally destruction fossil fuel projects. It can be exhausting, but it is absolutely critically, to be engaged in every step of the process to combat the fossil fuel industry. So who makes the actual decision? What is the situation there? Should lawyers be recruited? Good catch,Tecumseh. I clicked on the live link and learned more. Note that this report was done in No., and it was to be delivered to the governonr by late December. From what I gathered, there is significant opposition to this gigantic plan, so the governor would be bucking substantial opposiotion, but of course that has often not been a barrier for corporate interests. What happened in Dec, we don’t know from this report. I think I read elsewhere that the opposition actually won. “Washington Gov. Jay Inslee on Monday drove another stake into the battered heart of Vancouver Energy, the giant oil-by-rail terminal proposed for the Port of Vancouver. that Inslee wrote a letter to? Thanks for the update, but cautiously there’s a win for the good guys. Here’s where a guy that did color revolutions for the CIA is celebrated. Sorry for a 3-month delay. Just came across a link (from here*) to this article you and Jon commented to. From one of the resident locals (me) who has been opposed to these WA and OR fossil fuel terminals since they were originally supposed to be IMPORT terminals, not export terminals. My! how time changes what the money wants, eh? It’s NEVER satisfied. Funny how all this alleged fossil fuel exporting (oil, coal and natural gas — crude OR refined) is supposed to make the US energy independent. Certainly goes against everything conservatives preach about the laws of supply:demand dictating the prices of everything. If I live to a thousand I’ll never understand what constitutes logic to any conservative. Perhaps I … or they … are really from a different universe? By the way, Thurston County is NOT on or near the Columbia River, Vancouver, WA or SW Washington. It’s the county where the state capital is located, Olympia. Thanks for thinking of me. I was happy to read the results in your references.